We’re delighted to be able to be able to announce the addition of Kiefer Sutherland, Ashley Campbell, Sam Palladio, The Webb Sisters, Stu Larsen, the Sheepdogs, The Wandering Hearts, Rev. Sekou, Wildwood Kin, Sonia Leigh, Wade Bowen, Broken Witt Rebels, Jarrod Dickenson, Danni Nicholls, Whiskey Shivers, Ben Danaher, Alexander McKay, and Steve Young. 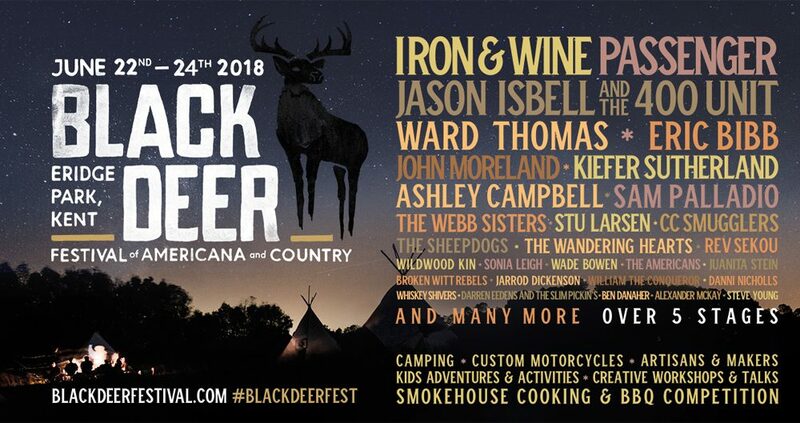 They’re are all set to join Iron & Wine, Passenger, Jason Isbell and the 400 Unit, Ward Thomas and the many more at Black Deer, this summer. But, we’re still not finished there. There’ll be even more artist announcements coming your way again soon. Along with the latest on all the amazing activities and culture you can get involved with in our Americana world. Be sure not to miss out, by snapping up a limited Tier 1 Ticket. These aren’t available for too much longer, and we’ll then be replacing them with our higher priced Tier 2 tickets. So be quick and grab yourself the bargain of the summer. Our monthly Payment Plans can help. Plus, with our Exclusive Group Offers, when you buy 3 tickets, you’ll get a 4th free.